Automate Your Reporting. Stay Relevant on What Matters. Keeping up to date on new activity and feedback being shared with your brand is important for you and your business. Customer feedback is a great way to ensure you are delivering the best of what your customers are looking for, which makes it very important for you and your team. Rannko helps you stay in the know by automating reports. Get in touch and stay in touch. Having your business data readily accessible is helpful for you to stay ahead of the game and on top of the trends. You pull and create reports to compile data in an easy-to-read overview that delivers the core data to you, your colleagues, and your management team. Taking the time to put these together takes your focus away from bigger things that propel your business forward daily. Rannko can help you save time pulling the same data, all while controlling the frequency with which you automate and share the reports. With you in the driver seat of your data, you can get back to business faster! Receive reports for your business that are branded to reflect your brand and your name. When sharing your reports with others in or out of your business, they'll always know what business they're looking at. Develop an automation schedule that works best for your business. Daily, weekly, monthly or a custom timeline, Rannko Reporting puts you in charge. Receive these reports in your email inbox automatically. Share your report with as few or as many recipients as you need. Add email addresses for all that need reports, and modify the recipient list as little or as often as necessary. Daily, weekly, monthly. No problem. Fully Customizable, from single to mult-location management. Generate a single condensed report for all locations. Great for multi-location and franchise accounts for ultimate control! See all your locations from a snapshot and allocate data timelines, "Lifetime AVG Ratings" and show total review averages. Ever had to compile a report with a very specific title? If you answered 'Yes', now you can easily with Rannko Reports. With you in charge of your report automation, you will always be up to date on the information that matters most to your business. 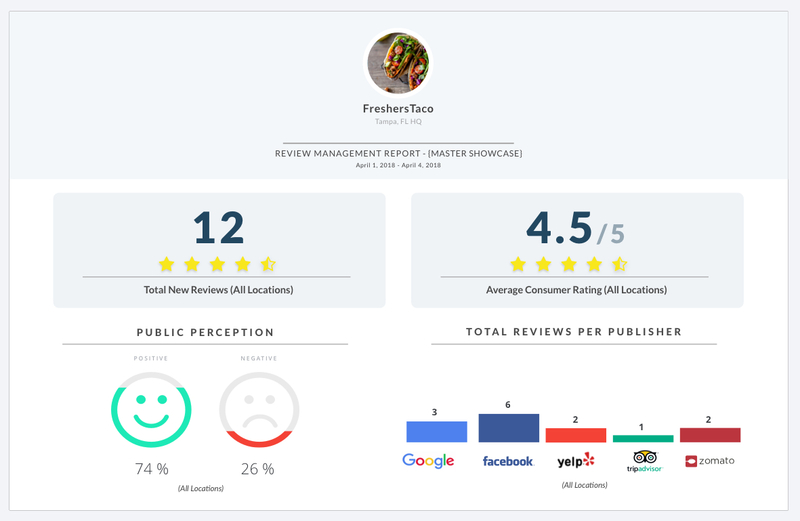 Your customer feedback is now more powerful than ever!